Set of 6 replacement mounting screws for 1970-1981 Camaro and Trans Am Filler Panel. 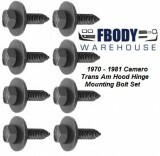 This is a set of 8 replacement Hood Hinge Bolts for 1970-1981 Camaro or Trans Am. These are Original GM Air Extractors (sold as a pair) LEFT & RIGHT for 1970 - 1981 Trans Am. 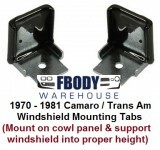 Fits all 1970 1971 1972 1973 1974 1975 1976 1977 1978 1979 1980 1981 Trans Am models. Colors will vary as many sets available in stock. All sets will have the mounting studs and mesh screening intact. Great shape, sand paint install and go! New replacement filler panel for 70-73 Firebird. This unit redirects cold air into the engine bay. New replacement trunk weather seal channels for 70-81 Camaro and Trans Am. 1970 1971 1972 1973 1974 1975 1976 1977 1978 179 1980 1981 Camaro Firebird Trans Am models. Unit operates well will need cleaned and oiled prior to install. Units are used and directly off the car. This is a new reproduction hood tension bar that mounts onto the radiator support. When you release the hood latch this pops the hood up. New replacement unit is GM Authorized. This is a used OER tail panel has been painted and prepped. Does have a repair as shown on the backside. 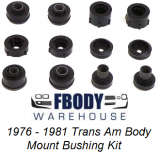 Discounted price as "Scratch and dent"
This is a full 1970 - 1972 Trans Am Bump Stop set. This set replaces all the old factory bump stops. Set includes the following items. This is a nose cone hood release cable base for 1970 - 1973 Firebird and Trans Am The cable sits within this and guidesit down to the release handle. Tough to find item! This is a used GM center radiator support brace for 1970 1971 1972 1973 1974 Trans Am and Firebird. Unit has been blasted and is ready to paint. GM trunk hinge assembly from a 1978 Camaro. This section where it is cut will fit all 1970 - 1981 Camaro Firebird TransAm models. Includes upper weather seal channel, full trunk hinge and rod assembly, under side metal pockets and jack holder. TRUE GM metal cut just how you need it!